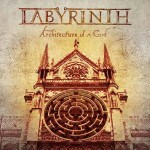 Share the post "Album review: LABYRINTH – Architecture of a God"
Labyrinth seemed to have disappeared off the scene follwoing 2010′s ‘Return to Heaven Denied Pt. II: A Midnight’, however they added vocalist Mark Boals to the line-up in 2014. Then last year a reunion of founding members Olaf Thorsen and Andrea Cantarelli on guitars was announced and they were joined by vocalist Roberto Tiranti (who had previously been in the band), drummer John Macaluso (ex-Ark/Yngwie Malmsteen/Starbreaker/TNT) , keyboards player and bassist Nik Mazzucconi on bass. A pretty big shake-up then and it seems to have done the trick as the band sound invigorated and full of musical ideas on this album. Opener ‘Bullets’ sets their musical stall out with a pomp keys intro, before that gives way to the pounding power metal beat, the guitar duels of Olaf Thorsen and Andrea Cantarelli and the soaring vocals of Roberto Tiranti. They really have found their mojo again with metal stompers like ‘Stardust and Ashes’ – the drums beating the listener into submission whilst the guitar solos hold your attention. For a little respite in this song bassist Nik Mazzucconi has a short funky solo, before the music resorts to its thunderous tempo. ‘Diamond’ is a clam oasis amongst all the power metal highlighting Roberto Tiranti’s vocals and there is a trance like feel to the keys/arrangements on this one. Interestingly the band cover the dream trance hit by Robert Miles (who sadly died in May 2017) ’Children’. Not a song you’d expect a band like Labyrinth to cover but it works and the guitars really fit seamlessly into the original beat. This entry was posted in ALBUM REVIEWS, ALBUM REVIEWS (Mobile), All Posts and tagged album, Architecture of a God, Labyrinth, metal, power metal, progressive, review. Bookmark the permalink.